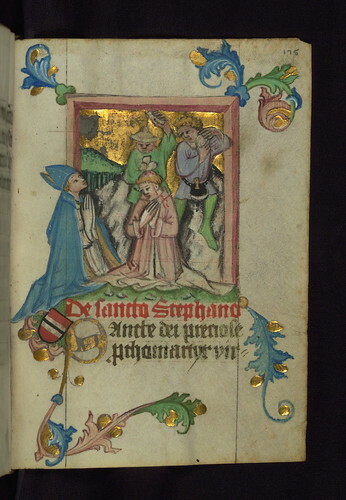 Prayer book of Bishop Leonhard von Laymingen of Passau, Martyrdom of St. Stephen with kneeling bishop and Laymingen heraldry, Walters Manuscript W.163, fol. 175r, originally uploaded by Walters Art Museum Illuminated Manuscripts. This late medieval German prayerbook is an example of a highly personal devotional item. It was originally made for Leonhard von Laymingen, Bishop of Passau, (1423-1451) circa 1440. The text primarily features a series of prayers to various saints as well as prayer for travelings. Many illuminations and some text pafgges have been excised, but the book is nonetheless extensively decorated. The prayerbook's illuminations consist of thirty miniatures and four historiated initials that complement the text, usually with illustrations of saints. Bishop von Laymingen appears in his prayerbook several times kneeling before the saint to which that particular prayer is dedicated. Additionally, the Laymingen coat of arms appears twenty times throughout the book.